Will Inflation surpass RBI's FY18 target, remain modest in FY19? The CPI inflation, which has been rising for two consecutive months in November, was higher than market expectations for the third time. Another rate cut on cards from RBI, but will bank cut your home loan EMIs? When India's inflation in November reached 15-month high, many experts and analysts predicted that the indicator will overshoot RBI's target by end of FY18. Consumer Price Index (CPI) inflation stood at 4.88% in the month of November 2017, up from 3.58% in October 2017, and 3.63% in the same month of the previous year. The CPI inflation, which has been rising for two consecutive month in November, was also higher than market expectations for the third time. The latest uptick was mostly led by a sharp rise in vegetables inflation, which shot up to a four-year high of 22.5% in Nov’2017 from 7.5% in the preceding month. Vegetables contributed 90 basis point to the month-on-month (MoM) rise in the headline inflation number. 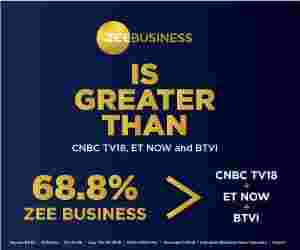 Analysts at Motilal Oswal stated that excluding vegetables, headline inflation stood much lower at 3.6% compared to preceding months. Interestingly, the overall CPI inflation came moderately above the core inflation in Nov’17 after remaining below the core-CPI for 14 straight months. Core inflation (all items excluding ‘food & beverages’ and ‘fuel & light’) rose to an 8-month high of 4.8% in Nov’2017 from 4.4% in October. The core-core inflation (excluding petrol/diesel from core inflation) increased to 4.9% from 4.5% in the previous month. Aditi Nayar, principal economist at ICRA, on November inflation data, said, "The uptick in the CPI inflation to a 15-month high in November 2017, was significantly sharper than expected, validating the caution displayed by the Monetary Policy Committee in its recent reviews." RBI expects inflation to range between 4.3-4.7% in Q3 and Q4 of this year, including the HRA effect of up to 35 basis points, with risks evenly balanced. So one thing is for sure that in FY18, the country's inflation number will shoot up the RBI's target, but the question remains as to how long it will continue to rise? Although the Central Statistics Office (CSO) will be presenting the CPI inflation data for December 2017, the SBI, however, states that the numbers are expected to remain at elevated level. “We project CPI inflation to come in between 5.0-5.2%,” the SBI added. If we look at the SBI data, average inflation for Q3FY18 will come around 4.51% on yearly basis, compared to 2.98% in Q2FY18 and 3.75% in Q3FY17. According to SBI, inflation will be higher from January – June 2018, owing to base effect. Also, some inflation numbers in the first half of 2018 could print over 5.5% and this could be a source of negative surprise. 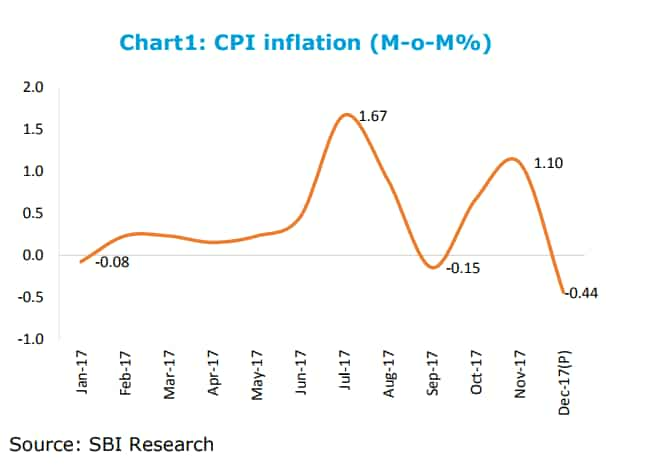 Further, SBI adds that it is not a cause of concern, as CPI inflation was rising since July 2017. It will result in toned down inflation for July - December 2018 period with some inflation prints even possibly slipping below 4% and hence a positive surprise. 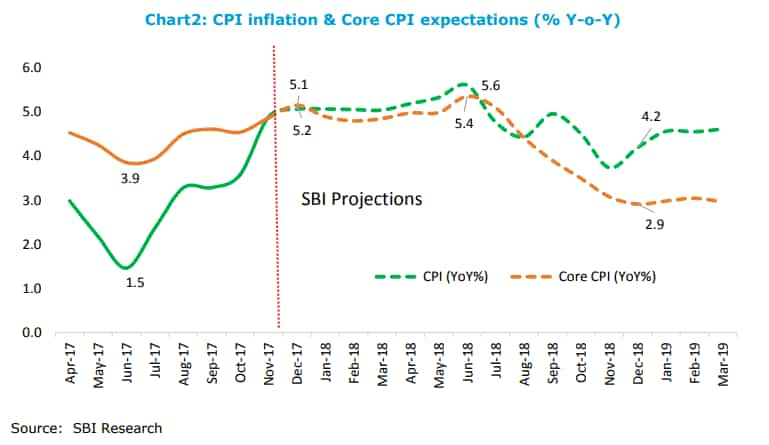 So on a net basis, SBI believes CPI inflation will remain modest in FY19 also at 4.5%. “The policy makers should rather look through the cycle of inflation data and not at point of cycle of the inflation data,” Ghosh added.